At a girls volleyball game at Gustavus Adolphus College in St. Peter, Minn., there is a rowdy group of ladies on the front row cheering enthusiastically. 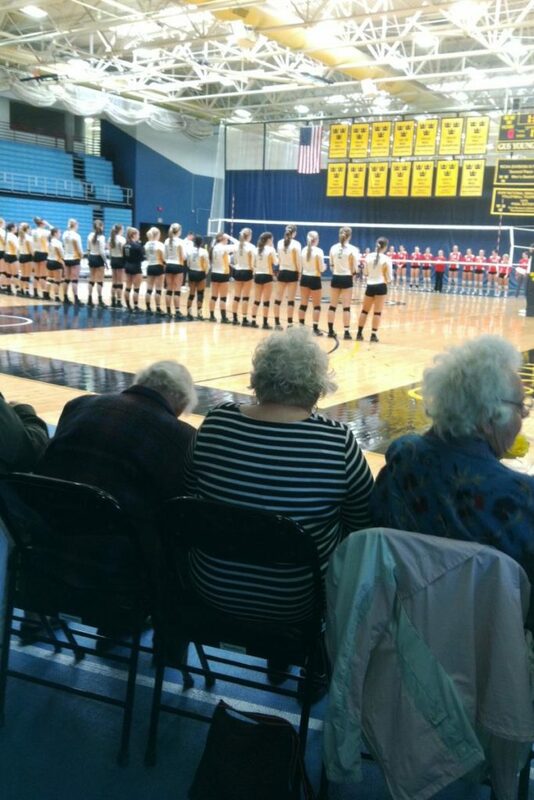 They might be mistaken for volleyball players’ grandmothers. But they are just very good older friends who have come from their assisted-living residence at Ecumen Sand Prairie, also in St. Peter, to show their support for these girls who have given them so much friendship and joy. 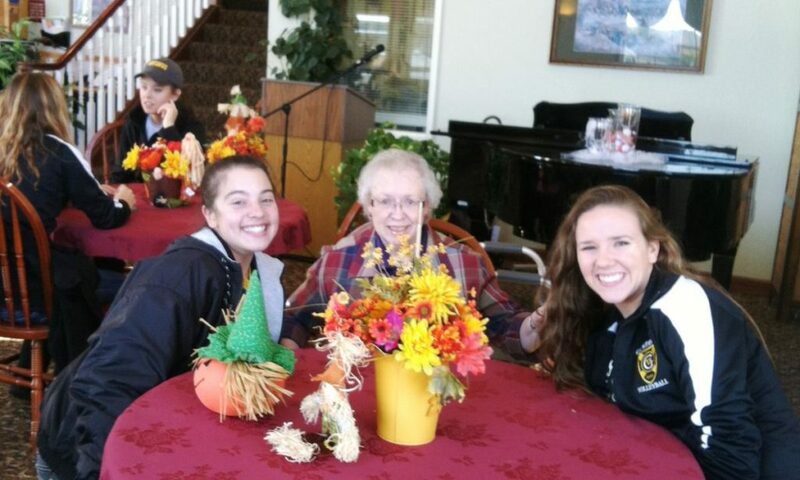 The Gustavus volleyball team has made sure their friends have the best seats in the house and have brought them roses to make them feel welcome and special. In return, the older women are cheering their hearts out. This special relationship started about three years ago when Gustavus girls volleyball Coach Rachelle Sherden talked to her team about doing community service work—something the team could do as a team that was bigger than volleyball. The coach threw out the idea of a pen pal program with young kids. But the girls countered that they would rather exchange letters with senior citizens. After all, since they have gone away to college, they don’t get to see their grandparents all that much. So Coach Sherden approached Becky Tapper, the activities coordinator at Ecumen Sand Prairie. Becky loved the idea. So did the residents. Now three years later, the program is still going and deep relationships abide. Some of the volleyball team members have been involved the entire three years. The program began with the residents and the team members exchanging letters. Yes, actual letters—those nearly obsolete things from bygone times now displaced by texts and emails. It turns out that there is still something special about getting a letter, written by hand, coming from the heart. Coach would hand them out at practice, and the distance between the 20-year-olds and the 80-year-olds would rapidly shrink. After a few letters, it was time to meet in person. The team went to Ecumen Sand Prairie for a visit. Coach Sherden recalls that she didn’t know quite what to expect from her team in this new situation. “The chatter was overwhelming,” Becky Tapper recalls. Clearly, this was not going to end when volleyball season was over. They made plans to stay in touch. 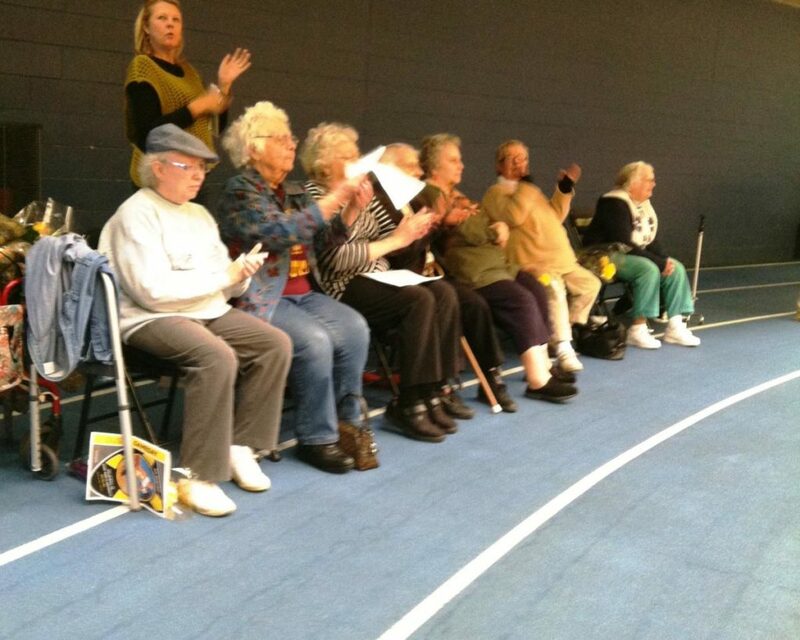 The residents went to a volleyball game. They all followed up with a pizza party. And the next season came and the program started all over again, with some new volleyball players and some from the year before. This is now the third year of the pen pal program, and Coach Sherden says she’s committed to keeping it going. The team loves it. “The girls want to know about everything,” Michele says. That’s probably because stories of lives well-lived never get old.